Special Containment Procedures: All currently known instances of SCP-1185 are to be maintained in storage at Site ██, with the exception of SCP-1185-3, which will remain installed in its original location and must be monitored at all times. Instances of SCP-1185 in storage are to be isolated from soil and other organic mediums at all times. Soil and organic media used in testing must be isolated from outside contact until the instance of SCP-1185 undergoing testing is removed from the area. Description: SCP-1185 is a collective designation for a set of gasoline pumps featuring identical manufacturer's marks and anomalous effects. Instances of SCP-1185 vary in age and design, in all cases appearing identical to other pumps installed in their facilities. The oldest known instance (resembling and installed alongside several Gilbarco Model 66 pumps) was installed in a rural Chilean town from 19██ until its discovery in 20██, while the newest (resembling a Dresser Wayne Century 2200 Series pump) was only one month old at time of discovery and removal by Foundation agents. All instances currently known possess identical manufacturer's markings on the base of the pump, though all other markings on the visible areas of the pump appear normal for the assumed model and manufacturer. These markings refer to a "Livewater Incorporated", an apparently fictitious corporation, the existence of which has yet to be substantiated. 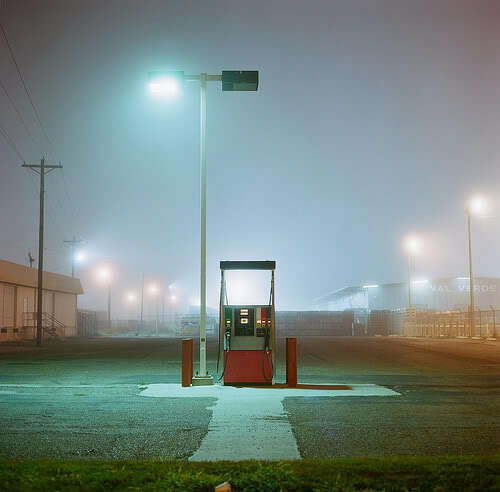 Employees and owners of fueling stations where instances of SCP-1185 have been located report no familiarity with any such corporation, and in all cases, the means of delivery and installation have been identical to common practice for non-anomalous pumps. When in close proximity to soil, instances of SCP-1185 extend fibrous tendrils from their bases towards the soil. These tendrils are metallic in composition, and are capable of penetrating several inches of concrete or asphalt should such stand between them and a mass of soil. Upon contact with suitably nutrient-rich soil, these tendrils branch out to form a pseudo-root-system of metallic fibers. The material composing the tendrils is an unknown metallic compound, which rapidly destabilizes and breaks down into various metal ions (primarily lead and copper) should the tendrils be disturbed. These fibers are hollow, allowing them to convey organic molecules to the pump, where an as-yet undetermined series of chemical reactions convert them into the component molecules of gasoline fuel. The exact composition of the fuel varies between instances, generally matching that of gasoline produced during the period of the pump's installation, and the process of conversion has no apparent mechanism; the substances extracted from soil appear to spontaneously break down and reassemble into the new molecular structures while passing through the pump. Disassembling and reassembling the pump has no effect on its anomalous properties, and installing any of an instance's components into other pumps of the same model will cause all components of that pump to take on the same anomalous properties. On initial installation, instances of SCP-1185 draw organic material from soil within a one-meter radius of the point of contact. Once soil resources have been drained to a degree that would render the supply inadequate, the pump’s tendrils extend further, resulting in its effects encompassing wider areas and causing increased depletion of soil resources. As operation of the pump continues, the increasingly widespread depletion of soil organic content begins to cause malnutrition in local flora and ground-based fauna. In cases where pump usage is especially prolonged or frequent, total ecosystem collapse can and will occur as the pump consumes and processes all available organic resources. Addendum 1185-001: On 4/13/██, a routine check on the fueling station where SCP-1185-1 was previously installed revealed similar anomalous properties in the new pump purchased as a replacement for the removed instance. The new pump was, according to the owner’s bank statements, purchased from the same corporation that had provided the other two, non-anomalous pumps in use. According to interview transcripts, a corporate representative met with the station owner and offered a heavy discount on the replacement pump to offset the loss of profits caused by the malfunction of the formerly installed pump (pump malfunction was indeed the cover-story used by the task force charged with removing and securing SCP-1185-1). On contacting and examining the records of the corporation in question, Foundation investigators found that a new pump was indeed shipped, but that no representative was ever sent, nor any discount offered, and that the funds received by the corporation were in accordance with the non-discounted price. The identity of the representative and source of the additional funds are currently under investigation. The pump, designated SCP-1185-3, is to remain installed at its current location and be kept under surveillance in hopes of establishing further contact with the producers or modifiers of the objects.